“Love Thy Neighbor” is the old adage, but when it comes trees, things can sometimes get ugly. 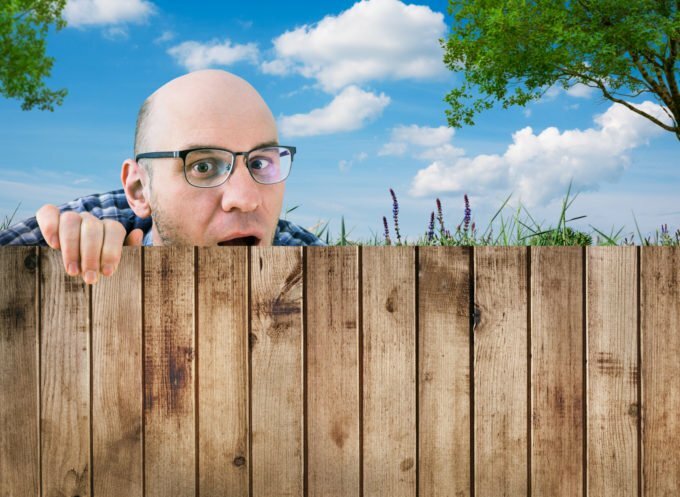 I’m specifically talking about a very common feud between neighbors: tree branches, tree trunks, or tree roots that cross the other’s boundary. Sometimes this can merely cause ire, other times the intrusion may be damaging or dangerous to property, electrical, or plumbing. The question many people want to know is: can I force my neighbor to cut their tree or can I cut it myself? The answer depends on a few different circumstances. First, of course, I recommend talking with the neighbor, if you are good terms. If you are unfamiliar terms, it could be a good way to introduce yourself so long as you are polite and friendly. After all, the neighbor may not even realize it is occurring. If you aren’t on good terms, this probably isn’t going to help any. But the fact is you only have the right to insist they cut the trees if the tree causes damage OR is an unhealthy/unsafe tree. You do not trespass in order to trim your neighbor’s tree. What if my neighbor’s tree is in danger of falling into my yard? This is where it gets a little trickier. Generally speaking, homeowners are required to make regular inspections of their trees to make sure they are safe and healthy. If you think their tree is unsafe, you should send them a letter, perhaps notarized, informing them of the danger. Subsequently, if there is damage, you will have proof of their negligence and could sue them. However, Texas law usually sides with the neighbor if the tree is healthy and they did not intend for the damage to happen (such as a healthy tree falling during a storm). In this situation, if the neighbor’s tree does fall into your yard and does structural damage, both the repair and the removal is likely covered by your home insurance policy [link: will insurance cover tree removal?]. Sometimes these tree branches hold delicious fruit. Now here’s where it gets interesting. According to FindLaw, you may not pick the fruit without permission, and some municipalities may prevent you from even eating fruit that falls in your yard! If you find yourself in this “jam” (pun intended) you may want to speak to a lawyer. If you’re having issues with your neighbor’s tree branches, and you just can’t seem to work it out… don’t call People’s Court, call us instead! We can inspect the tree in question and give you an opinion as to its health and safety as well as a free estimate for its trimming (certain services may require hiring a Certified Arborist for a small fee). Upon your approval, we’ll handle the rest. Our experienced workers will carefully trim only the offending branches to the end of your property line and make sure the tree trunk is not damaged. We won’t trespass into their yard and always completely clean up and remove all the trimmings. By law, you will be responsible for the costs, but we’ll do our best to make it as affordable as possible. We also take all major credit cards. If this is an emergency, feel free to call us day or night for an emergency tree removal (469) 706-9832. Rest easy that your property is safe from encroaching branches, contact us today!